Summer's harvest from last year include these gorgeous peppers (what did I plant last year?) and San Marzano tomatoes. Both were prolific and delicious. When summer is over, I don't want to touch another tomato, but by February, I'm getting geared up for a fresh BLT! The short days of winter are getting perceptibly longer. We are half way to the Spring Equinox, which is half way to the Summer Solstice. These dates became important in an agrarian culture and as one gets more involved in gardening, it is easy to see the reasons that these dates were important to people dependent on knowing what to do and when to do to necessary to stay alive. Valentines' Day is my traditional weekend for starting my tomato crop for the coming year. 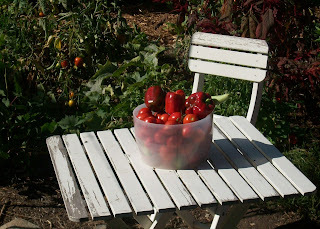 One method I have done in the past was to use fluorescent tubes about 6 inches above the pots for the beginnings of tomatoes – I have also started them outside with a heating mat to keep the soil warm; with enough sun that works well enough. Peppers and eggplant are started about 2 weeks later. As seedlings, they cannot be allowed to dry out and they must be protected from predation, it doesn't take even a small critter many bites to entirely remove a plant less than an inch tall. Basil. We must plant more basil. Is there such a thing as enough basil? Basil is planted right along with tomatoes – isn't that just poetic? I like the 'Genovese Profusitissimo' variety of basil – large productive, heavenly perfumed leaves that are the basis for my pesto recipe that has become the basis for my annual Pesto Day Celebration, my annual harvest festival. I make about 9 dozen half pints of The Gardenmaster's Special Pesto and it is well loved in the community. The recipe, which follows, is nothing special, the spectacular results are exclusively due to the ingredients: Genovese Profusitissimo basil and heirloom garlic combined with cheese, pignolis, olive oil, a little pepper and salt. Viola! Make sure to cover the pesto tightly or store in an airtight container immediately after making it. The top layer will discolor faster than the rest you can keep a thin layer of oil on top to stop oxygen from getting to the pesto and causing discoloration, but this will add more oil to the pesto each time you use it. Some of us think this is not a problem. And then I think “baseball”. (“Wait until next year”, is the universal call among gardeners and baseball players everywhere.) Dodger spring training in Arizona starts next month. 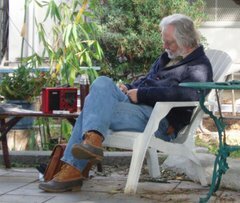 Win or lose, I’ll be out in my garden soon, radio in hand. Something about that baseball optimism dovetails nicely with my gardening optimism. You don’t have to “think baseball”, but I do and it lifts my spirit. February is positively the last month to dormant-prune fruit trees. One cannot plan that they won’t have broken dormancy any later than this. See flowers? That’s “broken dormancy” in a nutshell, the sap is running inside the tree and pruning after that drains more of the tree's vitality – mind you pruning late won’t kill your tree, some folks do this kind of pruning regularly – it’s my preference to do my pruning with the least harm to the tree and for me, that means before the sap begins to run and that means December or January in a Zone 24 climate. I have learned over the last few years that my nectarine and peach trees break dormancy first. Don’t forget to deal with slugs and snails. In these wet, cooler months, these little mollusks multiply with alarming proficiency and present huge problems. You can't get rid of them forever, they are migratory, so even if you could rid yourself of every single one in your garden on Tuesday, you'd have a whole new supply by Friday coming in from next door. And more on Saturday. It's baffling. Some gardeners keep a five gallon bucket on hand with soapy water in it and drop the critters in for a quick death. Others put a board down with one end slightly raised. Slugs and snails will congregate there and can be simply crushed. Good for the soil. A fairly new product, 'Escar-go' is on the market and is non-toxic to mammals (you, your children and dogs and cats etc), and is actually beneficial to the soil. Slugs and snails eat it and die. Probably not as humane as crushing them, but more acceptable in polite society. No matter what you do, you will probably always have problems with snails and slugs in our climate unless you are fortunate to have a possum on hand. These homely marsupials consume slugs (mostly) and will resort to snails if hungry enough. I am fortunate in The Learning Garden to be blessed with a possum or two that have negated any need to bait or board for snails and slugs. Broccoli is being harvested, along with cauliflower, cabbage, peas, scallions, carrots, radishes, beets, new potatoes, chard, kale, and lettuces by the bushel. The garden looks stellar at this time of year, it is bursting with produce of deep green, blue green, punctuated with red and yellow (chard) flags. Don't stop planting lettuce, that will continue right up through May. It is easy for us because we are so close to the Pacific Ocean – my cool season plantings can stretch through all months except late July through late September. Warm season crops aren't nearly so flexible because our night temperatures are never that high.